Quadra Game - Download and Play Free Version! Shift the Blocks and Clear the Board in This Addictive Puzzle Game! You may have played similar puzzle games featuring falling blocks, but you've never played anything quite like Quadra. The game is played on a rectangular playing grid. Blocks shaped like tetrominoes fall from the top of this grid, and players direct their fall. If the blocks form a solid row, the row disappears from the grid. This simple gameplay is fun and incredibly addictive! Quadra takes puzzle gameplay to the next level by adding gravity to the equation. The result is the possibility of explosive, massive moves that clear more than four lines of blocks at a time. With careful stacking, the majority of the board can be cleared with a chain reaction sparked by a single move. It takes strategy and practice, but the payoff is sweet! For block puzzle fans who like to make thought-provoking plays, Quadra is the ultimate end game! Normal mode starts out slow and builds in intensity, gaining speed and momentum as levels increase. Sprint mode is five minutes of fast and furious puzzle action. Choose the single player mode that fits your mood and playing style! 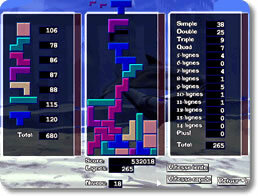 While the single player mode provides hours of engaging puzzle action, multiplayer mode is where Quadra really shines. Players from all over the world can join up and play together in real time thanks to Quadra's built in TCP/IP connection. You can either join in on another player's game or start one of your own. Massive multiplayer battles are made even better with the addition of new and unique rules in each game mode. Free for all: Attack quickly and strongly to earn frags. If you die, press any of the control keys to play again. Survivor: Glory to the last man standing. The game is divided into rounds. A round ends when only one team has any member alive. Then everybody restarts with the same series of pieces on a clean canvas. If you die, you will have to wait until the beginning of the next round to play again. Peace: Enter a breakneck race for points. There is no way to attack your opponents, so the goal is to score as many points as possible. Blind: Attack strongly to confuse your opponents. Instead of receiving lines from your attacks, your opponents will receive blind pieces. These pieces will stay invisible for five seconds after being placed. Hot Potato: Clear lines to get rid of the hot potato. The team holding the hot potato receives all the attacks from everybody else without being able to fight back. Get rid of the potato as soon as possible. Quadra is a fantastic puzzle game that's family friendly and sure to please any puzzle fan!